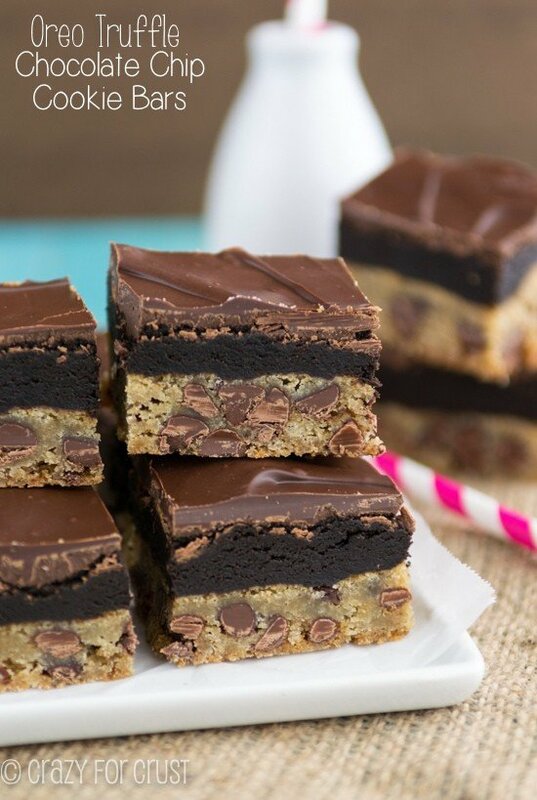 Gooey Chocolate Chip Cookie Bars are worth every calorie! 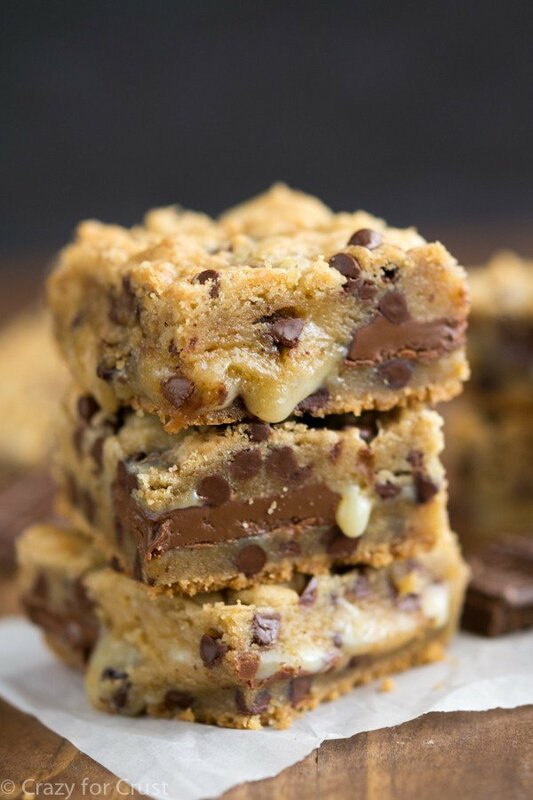 These easy cookie bars start with the best chocolate chip cookie recipe and are filled with gooey chocolate and sweetened condensed milk. They’re a gooey bar from heaven! 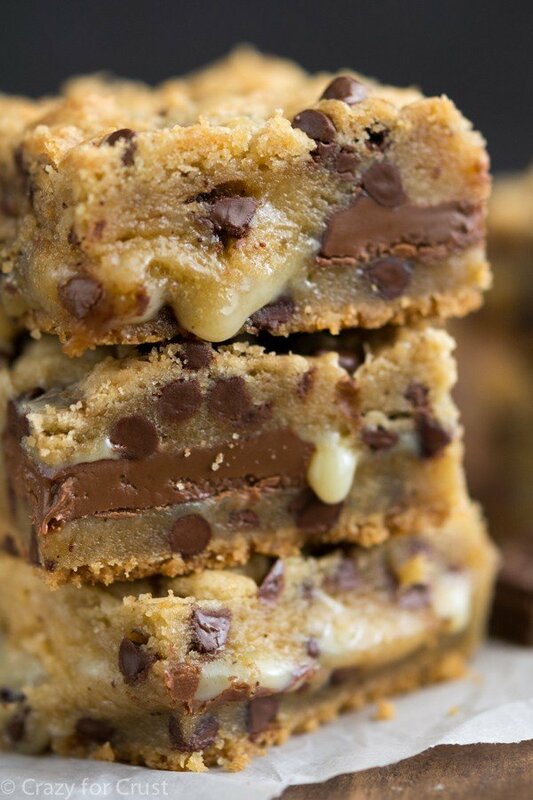 Gooey Chocolate Chip Cookie Bars are the best and most popular cookie bar recipe!! 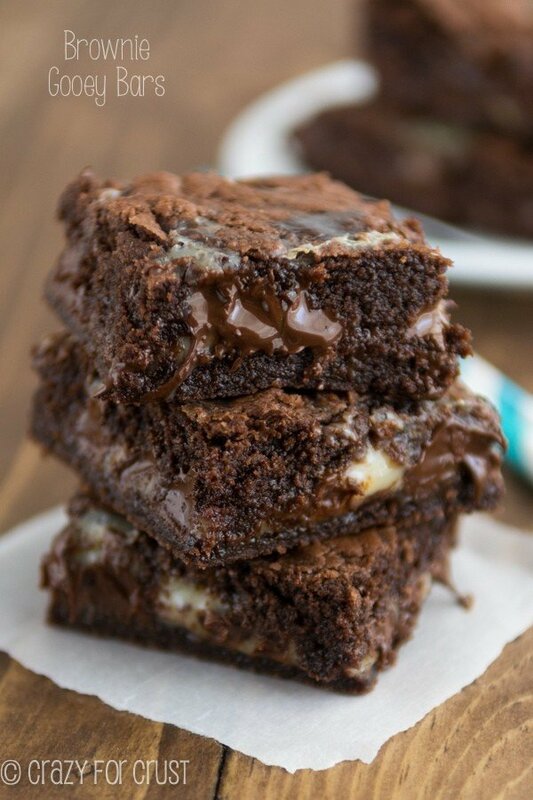 They’re full of chocolate and sweetened condensed milk and everyone loves them. The chocolate chip cookie recipe starts with brown butter. If you’ve never browned butter, don’t worry. It’s actually easy. You can read my tutorial on how to brown butter before you start. 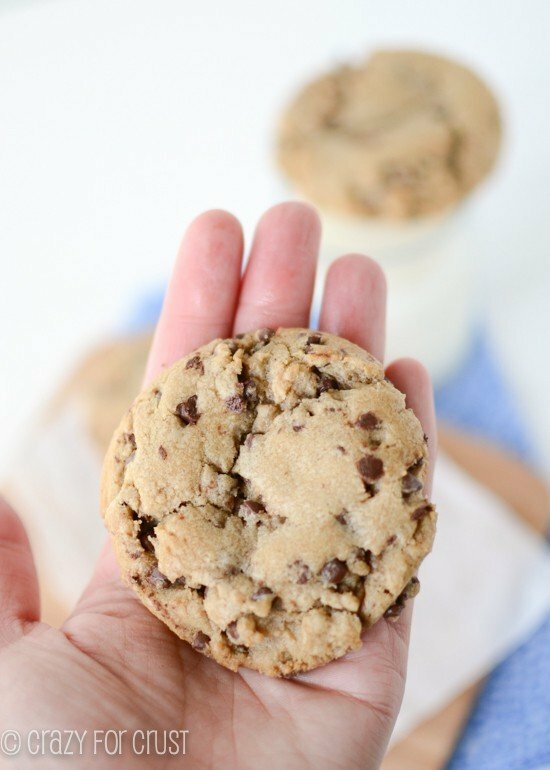 If you don’t want to brown the butter you can start with my best chocolate chip cookie recipe instead. It’s got one less step but is just as good. Another reason I love this chocolate chip cookie recipe is because it has a ton of brown sugar in it. When you add the brown sugar to the melted butter it creates a toffee-like flavor that is sorely missing in non-melted butter cookies. Normally, starting with melted butter means you have to chill the cookies for hours or overnight, which is why making chocolate chip cookie bars is better. I love that chocolate chip cookie bars are made in a 9×13-inch pan; no scooping or rolling needed. Just press and bake! 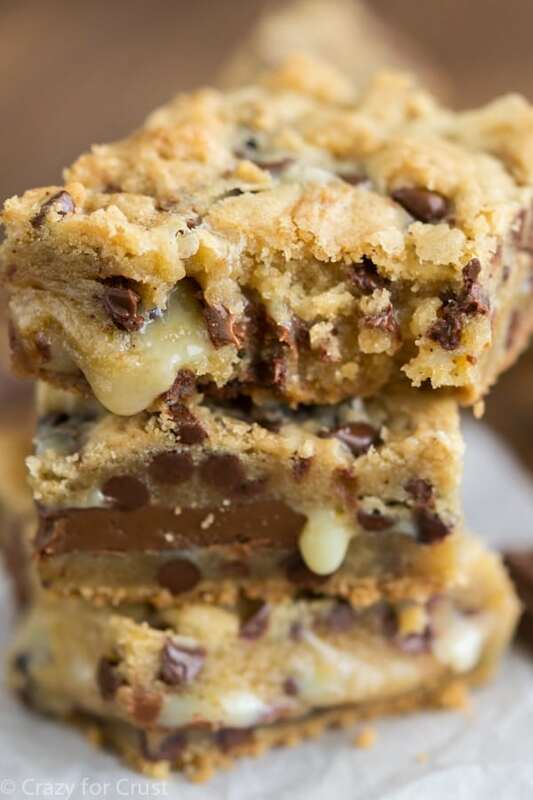 These GOOEY easy chocolate chip cookie bars are even better than plain chocolate chip cookie bars because in between two layers of cookie dough you pour an entire can of sweetened condensed milk. This makes them gooey in the center. And because more chocolate is always better, they have chopped up Hershey bars in the center too. You could also stuff these with Oreos or peanut butter cups! 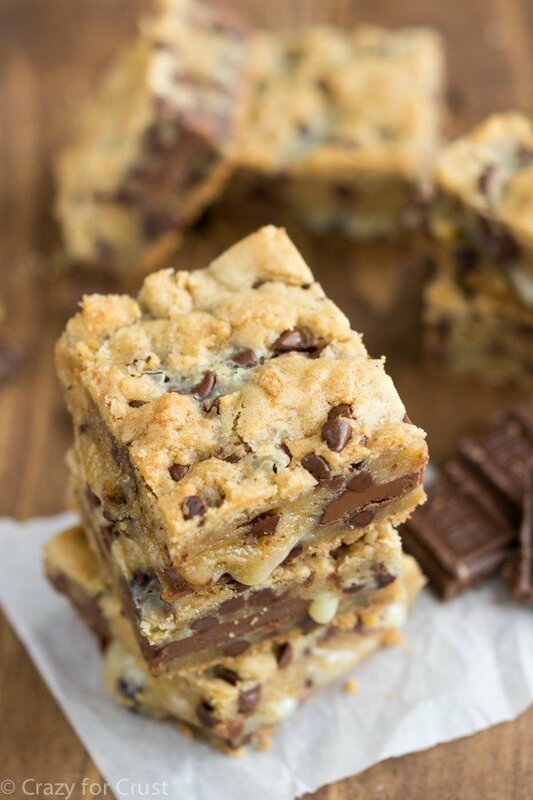 Gooey Chocolate Chip Cookie Bars are the perfect comfort food and great for a potluck, party, or a random Tuesday. Make sure to leave a border around the edge of the pan that doesn’t have sweetened condensed milk. It’ll bubble up around the outside of the pan if you do. It’s really helpful to bake these on foil for easy removal. It’s easiest to slice these cold. For the gooey look like I have, reheat them after slicing. 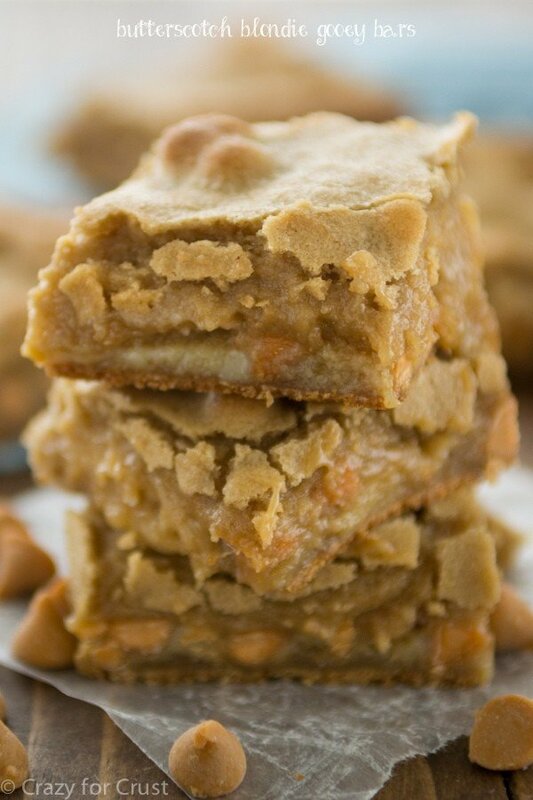 Click here for my ultimate Football Party Menu and all of my gooey bar recipes! These were realllllllly good, but my cookie dough was dry and crumbly. I double checked the ingredients. Maybe, I had a little too much flour. I also forgot to refrigerate them for 30 minutes before cooking. Guess I’ll just have to try them again! Lol! I made this recipe and the chocolate chip cookie dough was extremely dry and crumbly. I feel 3 1/4 cups flour is way too much! Maybe try 2 cups first and then add a little more as needed until it’s a nice cookie dough. Love this! Made it exactly as written in the recipe. Just finished making these! I made one sub, caramel SCM for fat free, since I had a can in the pantry (sale item! ?). Will definitely be sharing! Has anyone tried this with a Symphony bar or any other candy bar? I’m not sure fan of Hershey’s chocolate. I plan on making this soon. We’re starting Christmas cookies and why not have this on the cookie tray? Instead of a chocolate bar, how about a Hershey’s Symphony bar – chocolate and toffee, YUM! This is a great recipe, but it usually takes me at least 12 to 14 minutes to brown the butter.